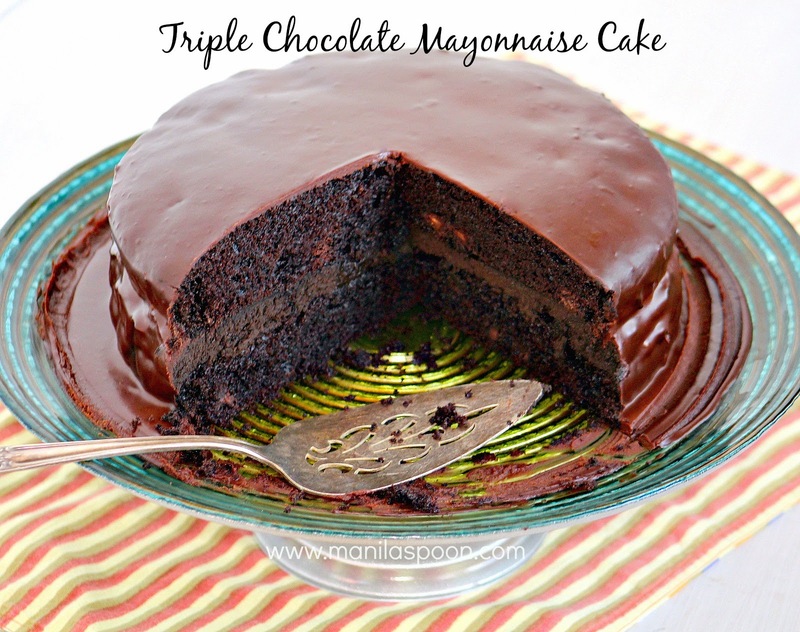 The secret ingredient that makes this cake so moist is Mayonnaise! Add 3 kinds of chocolate and it’s chocolate indulgence at its highest. I was looking at the file photos of my unpublished recipes and lo and behold I found a few digital copies of this chocolate cake. I was surprised that I haven’t shared this yet after nearly a year of making this. I recall baking this for a kind friend and neighbor who helped us paint our house last year before we moved to Connecticut. I made him chocolate cake whenever he was over at our place because I know that it is his favorite dessert. I guess it must have been the crazy busy-ness of the move that I thereafter forgot about some recipes that I made last year which have yet to grace this blog. Oh well, I am rectifying that mistake and sharing today this classic southern cake before I forget about it again! Being the chocoholic that I am, I added more chocolate to the mix – apart from cocoa powder you have extra chocolate goodness from the semi-sweet choco chips and to top it off – a dark chocolate ganache for the ultimate chocolate indulgence! Whether you wish to go all the way by adding all the chocolate flavors in there or you simply want a subtle chocolate taste, you will enjoy this moist cake! Use either your favorite store-bought chocolate frosting (I used one when I first made this cake) or your favorite homemade recipe, if you have one. If you need one for the filling – here’s a good and very easy recipe. This is for a full entire cake (not just for cake filling) so I suggest cutting the recipe in half and adjusting the sugar and chocolate content to your taste. Use the filling/frosting when making the cake in 2 pans. Preheat the oven to 350F. Butter 2 round cake pans (9-inch ones) and line with parchment paper. Mix together the flour, cocoa powder, baking soda, baking powder, coffee and salt in a bowl. Set aside. Add the eggs, mayonnaise, sugar, water and vanilla into the flour mixture. Stir until well-blended but do not overmix. Fold in the chocolate chips. Transfer the batter to the prepared pans. Bake in the preheated oven for 20-23 minutes or until a toothpick inserted in the center comes out clean. Oven temperatures vary so adjust the time accordingly. Cool the cakes in the pans for 10 minutes and then transfer to a wire rack. Cool the cakes completely before adding the chocolate filling and coating with the ganache. Place the heavy cream, chocolate pieces and the liquid sweetener of your choice in a small saucepan. Melt the chocolate using low heat and by stirring until it becomes very smooth and shiny. Remove from the heat and immediately drizzle/pour it on the cake spreading it evenly to cover the entire cake. Allow the ganache to fully set before serving. looks so rich and moist…..really mayonnaise? I will haev to try this for sure. What a beautiful cake! I have forgot about recipes before, and found them later. It's a fun surprise! Thanks, I have been discovering these old recipes and experimenting with them and finding them to be quite good actually. Thanks for stopping by Sarah. Oh my gosh, Abby, this cake looks like the PERFECT chocolate cake. Just looking at it is making me salivate. Beautiful! OMG this looks sooo moist and decadent! Love it! Looks so good. I made mayonnaise brownies once, but this looks divine! Thanks, Ren! That's a wonderful idea which I have never tried. On my to do list. Thanks for the tip and for stopping by. This just heaven!! Absolutely LOVE it! Chocolate heaven, indeed Del! Thanks! Wow this is a tempting moist and chocolatey cake…looks amazing! Thank you Sandi! 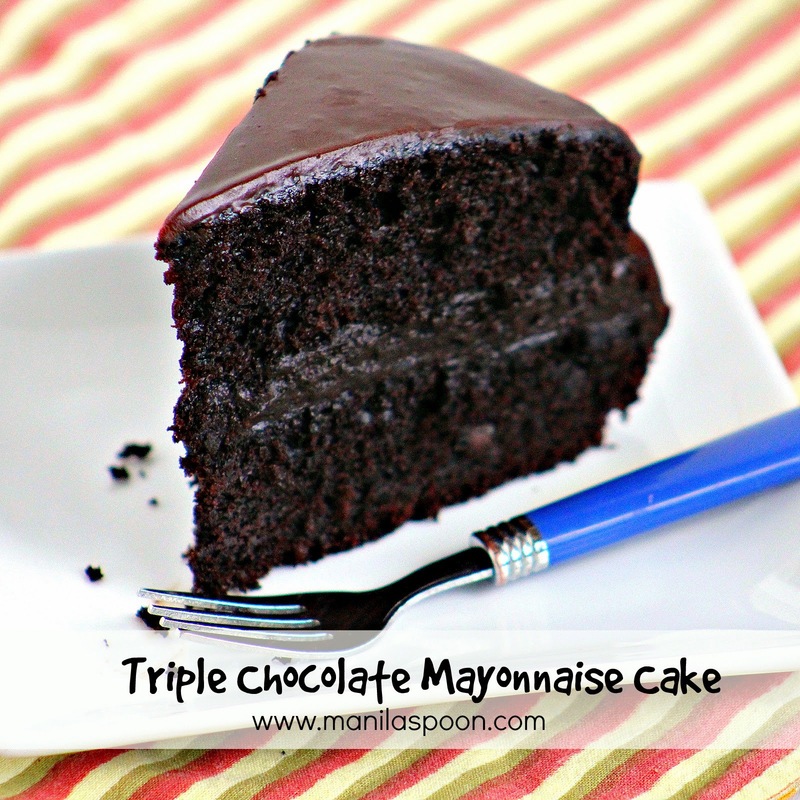 It still amazes me that adding mayo can make a chocolate cake so good. This looks so moist and yummy Abby. Love it. Thanks, Libby! Am not a very good cake maker so when something turns out good, I am so delighted. Thanks, Camilla! It's been enjoyed much in our house for sure. Glad you stopped by. Oh my gosh I need a piece like NOW! This looks delish! oooh, you have reminded me of an old college favorite of mine! now that there is a great vegan mayonnaise option, I will have to try this again! thank you! I thought of how that may be. If you've tried the vegan one please let us know Kristina. Thanks. Looks delicious, but I think there is a mistake in the recipe. There is no cocoa listed among the cake ingredients, but the directions refer to adding cocoa and flour. Anyhow sounds like a wonderful cake. I guess you should revisit, unsweetened cocoa is the second item in the ingredients. Will make it for my family. Thanks for sharing this ingredients. Thanks, Pamela and hope you enjoy this. Oh! So rich and chocolaty! This looks amazing and I'd love to try it — the mayonnaise is a new addition for me! Definitely worth trying Patricia as it really works. Thanks for dropping by. Does the mayonnaise enhance the flavour or is it more for the texture? I would love to try this recipe. Hi Lisa, I read somewhere that mayo makes the cake moist and tender due to its egg and oil content and the vinegar in it punches up the chocolate flavor a little. I also add a little coffee to enhance the chocolate flavor more. The cake in the photo uses the frosting as filling and then the chocolate ganache as topping. But you can just use the frosting, too or keep the cake plain. Thanks. Hope you like it. It's only breakfast time here and I think I need a slice of this! I'm trying this right now but I don't know what degree to put it on. I really hope 375 is alright. The recipe above specifically mentions 350 F Genesis. Please check it and hope you like it. Thanks. Thanks, Jennifer and hope you enjoy it! Recipe calls for coffee but no mention of the coffee in the mixing of ingredients? Do you put the coffe grounds in cake or make the cup of coffee as usual and pour it in cake mix? The recipe instruction states that the coffee should be added with the other dry ingredients. That’s how I’ve done it and I like it that way but you can try the other method if you like but you need to adjust the rest of the ingredients. Thank you! Welcome! Thank you for the recipe. I can't wait to try it. It's ok not to use coffee – I added it because it intensifies the flavor of chocolate – so even if it's there – you won't even taste it at all – just a good chocolate flavor enhanced by coffee. Just like the mayo – it's there but you won't taste it. But it's up to you – perhaps you can just add an additional tablespoon of cocoa powder. At any rate, however way you do it hope you like it. Thanks for asking! Grew up in Central NY and mayonnaise cake was something everyone made. So delish! I can't believe how many people have never had this. I guess it's the best kept chocolate secret! I have been making a chocolate mayonnaise cake for 40 years. Mine doesn't have coffee in it. I don't drink coffee & I have never had it in my home. What would you recommend as a substitute? You don't need to add coffee if you don't wish to Debra. I added it to enhance or intensify the chocolate flavor but it may be left out if you don't drink coffee. Perhaps simply slightly increasing the cocoa powder may help, too. Thanks for asking! This cake looks amazing! Definitely going to try it. Do you think I can use milk or even buttermilk instead of water? I haven't done so but certainly worth a try Liz! It may even add more depth of flavor. Let us know how it goes when you try it. Thanks! I frequently sprinkle a few instant coffee crystals on ice cream, cake,and other dishes to add a surprise or additional depth of flavor. Doesn't take much. Can you use miracle whip or do you have to use real mayonnaise? I haven't tried Miracle Whip so I am not sure but if you do, please let us know how it goes. Thanks! Looks sooo delicious i will give a try for sure soecislly with the hero ingredient the mayonsise !! Thank you soo much for sharing ❤️ Do you have an insta account? We love this cake and hope you enjoy it, too. Yes, I do have an instagram account — https://www.instagram.com/manilaspoon/ – see you there!! I have made this cake for tomorrow… will I need to refrigerate because of the mayo and the cream in the ganache? The mayo has been cooked so I don’t think it would be an issue but perhaps it’s best to refrigerate it because of the ganache but do bring it to room temperature first before eating. Thanks! Just plain tap water or room temp. I really just used that. 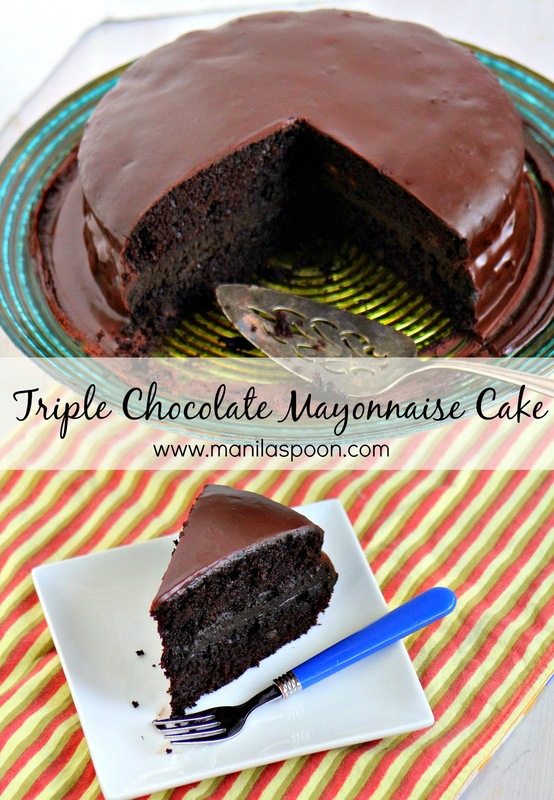 Grew up having Mayonnaise Cake from a Depression Era recipe collection of my Mother’s. A family favorite !!! So happy to have come across the recipe again, moved a while back and somehow lost one of my recipe boxes! Oh My! How sad I was to realize this! Have made many of your recipes, KEEP UP THE GOOD WORK!!! 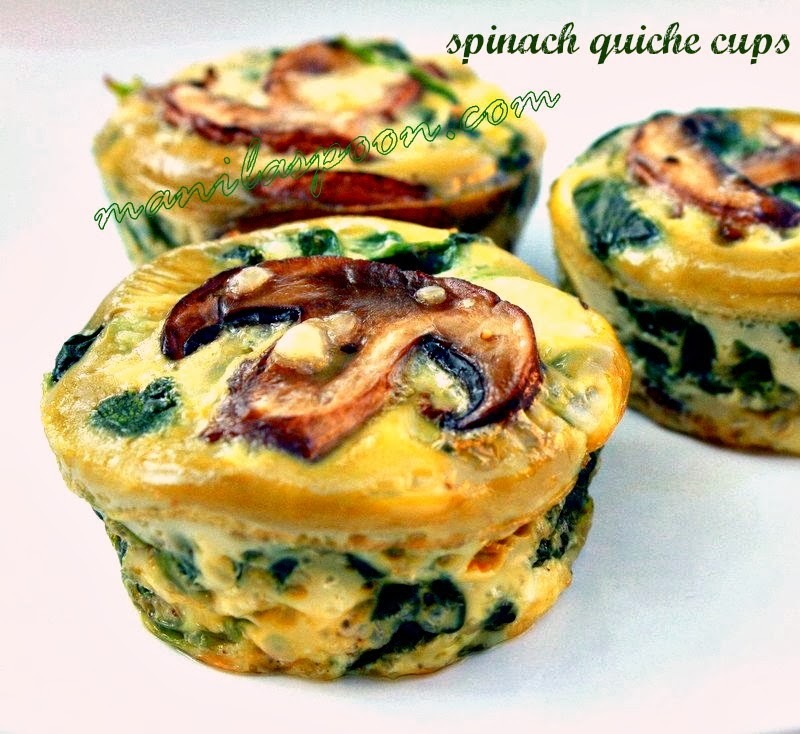 So happy to know you’ved enjoyed our recipes and that this one brings sweet memories. Thanks for stopping by!! This looks ivine. I am definitely giving a try.. Thanks for sharing. So glad to know that Sarahi. Thanks for letting us know. Yes but use a small one because it’s not a huge cake.